Legislators, judges and state officials converse in the House chambers after Gov. 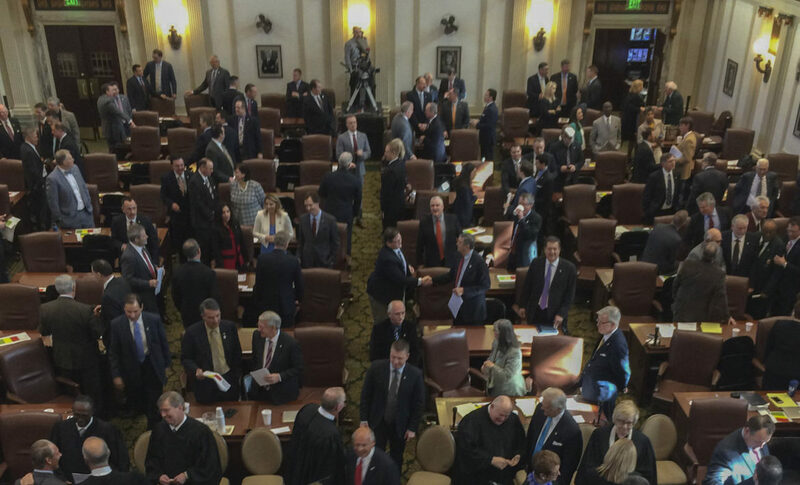 Mary Fallin's "State of the State" address on Feb. 1. As Oklahoma policymakers grappled this year with a $1.3-billion budget shortfall, special-interest groups plied them with more free meals, drinks, Thunder tickets and other gifts. Oklahoma Ethics Commission filings show a total of 195 lobbyists gave out $344,600 worth of gifts from January through May – or nearly $30,000 more than in the first six months of 2015. It was also more than double the $155,892 spent in the first half of 2014 – the last year when stricter lobbying polices were in place. That change raised the cap in many cases for how much in gifts a state lawmaker or official can receive each year. It also possibly made the reporting process easier, so it’s hard to determine if after 2014 lobbyists began spending more or just reporting more, said Lee Slater, executive director of the Ethics Commission. The disclosure rules are intended to let citizens know who is paying to curry favor with officials and limit the influence of money. In general, political watchdog groups don’t view meals or tickets as quid pro quo, but the gifts can represent a form of access and influence for powerful special interests that members of the public don’t enjoy. A key reporting gap remains: Lobbyists, who often have multiple clients, do not have to indicate which client or clients they’re representing when they buy a meal or gift for a legislator or state official. They do have to report the client being represented when they buy gifts or meals for a group of lawmakers, such as a party caucus. Ethics Commission data indicates that legislators accepted an average of $957 each in gifts this year through May. More than 90 percent occurred during the legislative session, which ran from Feb. 1 to May 26. The most common expense was food and beverages, disclosure reports show. These ranged from $3 for a food-truck lunch to more than $150 for a single meal. Oklahoma City Thunder tickets, including for playoffs games, were popular. About 100 tickets, worth more than $9,275, were given to lawmakers and other officials. All but two of the 149 legislators accepted at least some gifts this year. Those two were Rep. Elise Hall, R-Oklahoma City, and Rep. Jason Murphey, R-Guthrie, who posts a sign outside his Capitol office saying he does not accept gifts from “lobbyist-represented entities,” disclosure reports show. The data shows that Republicans took in slightly more than their Democratic counterparts. GOP lawmakers averaged $997 apiece compared with $847 for Democrats. First-term Rep. Casey Murdock, R-Felt, received the most among legislators for the second year in a row. Felt received $2,971 worth of gifts, mostly in meals and beverages, from 37 different lobbyists. The other top recipients were Rep. Tom Newell, R-Seminole, $2,626; Senate President Pro Tempore Brian Bingman, R-Sapulpa, $2,576; Sen. Mike Shultz, R-Altus, $2,449, and Rep. Chris Kannady, R-Oklahoma City, $2,381. Minority Floor Leader Rep. Scott Inman, D-Del City, was the only Democrat to receive more than $2,000, getting $2,160. Several top state officials also took in hundreds of dollars in gifts. Gov. Mary Fallin accepted $347 in gifts, including two $80 Thunder tickets. In addition to gifts to individuals, lobbyists spent more than $171,800 on meals or events that were open to the entire Legislature or the House or Senate caucuses. Those included a $14,693 legislative reception held in conjunction with a firefighters conference; $11,562 for a legislative reception sponsored by the Oklahoma Restaurant Association, Oklahoma and Lodging Association and Oklahoma Travel Industry Association; and $11,387 for the Oklahoma Youth Exposition’s legislative and celebrity showmanship reception. Kenneth Sparks, who represents the Oklahoma Association of Electric Cooperatives, led the 195 lobbyists in spending. But of the $21,545 he gave out, $19,981 was spent on the association’s “Out of the Gate” legislative reception. Other big spenders were lobbyists who represent multiple groups. For example, Jami Longacre, who represents 10 companies or organizations, made 232 separate expenses totaling about $18,500. Robert Huddleston, who lobbies for Anheuser-Busch, Wells Fargo, Invenergy and seven other groups, made 196 expenses totaling nearly $18,000. Before 2015, the state limited special-interest groups or companies that employed one or more lobbyists to spending no more than $100 worth of gifts on each lawmaker or state official per year. With the change, each lobbyist can now give away up to $500 worth of gifts per lawmaker or state official annually regardless of the number of clients he or she represents. That means lobbyists representing fewer than five clients can spend more. The Ethics Commission also began requiring so-called “legislative liaisons” or “executive lobbyists” – state employees who lobby policymakers on behalf of their agency – to report their gifts. Oklahoma legislators received nearly $84,000 in free meals, tickets and other gifts during the first five months of 2016.